Darroch’s ‘Holy crap’ moment came in the $500k GTD Powerfest Phased final, a field of 1534 fighting it out for over $652,000 and bragging rights. Some eleven hours after it started and Darroch was facing fellow Canadian, Mike_420, heads-up, and although he couldn’t quite take down the win, the biggest cash of his career - $78,258 - proved that partypoker made a wise decision in adding the TwitchTV streamer to their roster. The $1million guaranteed version of the Phased event also saw the guarantee topped up when 647 entries paid $2100 apiece and that meant almost $200,000 up top – the biggest payday of the Sunday highroller grind. 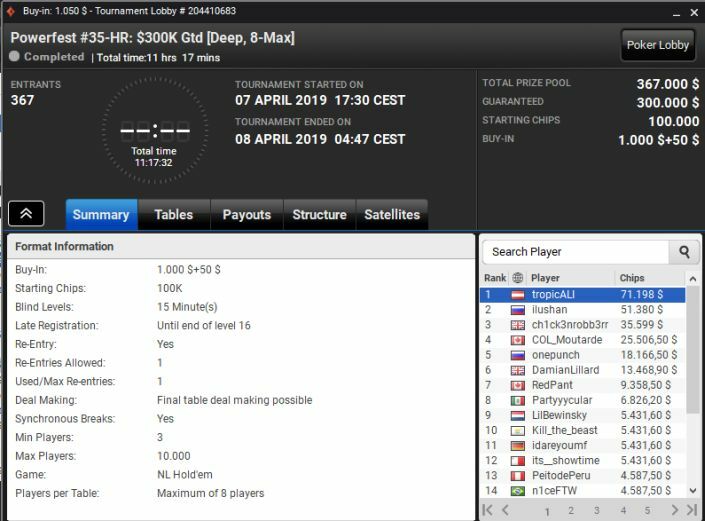 Finnish legend Sami LarsLuzak1 Kelopuro made it to the final table, as did SchelampigaUhu, believed to be the online nickname of German highstakes crusher Ole Schemion. 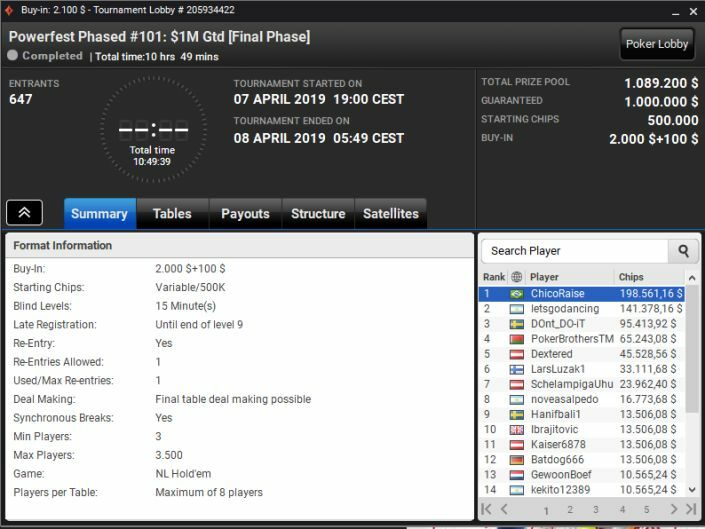 Kelopuro could only make a 6th place finish for $33k or so, one spot ahead of Schemion, leaving the 6-figure paydays for 1st and 2nd to be fought out between Brazilian grinder ChicoRaise and near neighbour, Argentina’s letsgodancing. The Argentinian fell at the final hurdle but will likely still be dancing, with joy, at his $140k+ cash, while ChicoRaise goes into the record books as victor and $198,561 richer to boot. There was also huge POWERFEST money up for grabs in the $5200 buy-in 8-max, with partypoker’s very own Kristen Krissyb24 Bicknell running deep. A slightly disappointing exit in 11th place for Bicknell saw her cash for close to $15k, but the really big money was destined for two of the still anonymous highstakes grinders, spiritDNA and limitless. Limitless isn’t quite anonymous, the former handball pro known as Viktor and previously giving interviews, but yesterday he would have to settle for second place and $110,550, while UK-based spiritDNA walked off with $154k for his win. Moving down the takes slightly, the $1050 buy-in high roller, event number 35 on the POWERFEST schedule, saw 367 entries and over $70k up top. 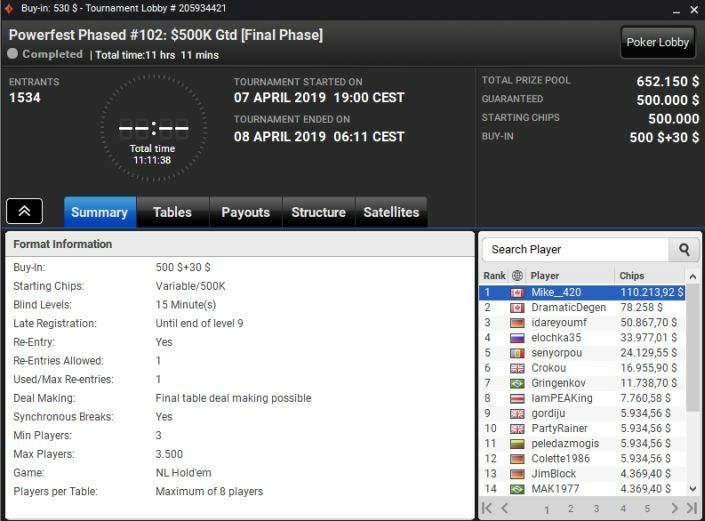 The UK’s DamianLillard has been in fine form recently, and another final table appearance saw him add $13k plus change to his bankroll, with fellow UK player ch1ck3nrobb3rr securing 3rd spot and $35,599. The victory, however, went to tropicALI who toppled Russia’s Rushan heads-up to take the POWERFEST crown and a more than healthy $71k payday. To finish off the Sunday highroller roundup from partypoker’s POWERFEST, the $530 buy-in, $250k GTD HR saw 626 entries, adding an extra $63k to the prizepool. There were plenty of Canadian Maple Leaf and UK Union flags flying at the deep end of the slow, 8-max tournament but it would prove to be a Belgian victory at the end of the day. La.Brouletterie completed a fine tournament by defeating spinner2255 headsup and emerged with the title and $57,654.60 after a 10 hour battle.